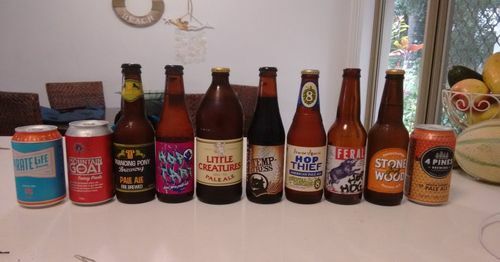 For the 2018 Beer Swap I got LJ Dave Polaschek who is not an IPA fan so I got to try lots of different beers! He got local (to me) Saison, Stout, Mango Wit, Golden Ale & Pilsners plus an Oatmeal Raisin Cookie Brown Ale from Tampa and a Helles Dopplebeck from Louisiana. The bottle opener handle was turned from spalted pecan out of my yard and finished with CA glue. The snifter glass came from Ology Brewing in Tallahassee FL (where the 2 big cans are from). Thanks to Kenny for running a fun swap! And thanks for a swell opener and tasty beers, Grant! Nice looking opener Grant. Is it just me or did it get thirsty in here all of the sudden? I think it’s beer thirty. The pecan handle is a handsome devil. It’s gotta be close to beer 30! What on earth! there is no such thing as “close” to beer 30! ...its allways beer 30! 2. What does IPA fan mean? answer to #2-he doesn’t like india pale ale beer. 2. I have never seen a pale indian they are all red from what I have seen on F Troop and John Wayne movies. Disclaimer: There is no such thing as a “bad” beer! We have some really good mind altering liquids here in Austrailia as well.